The Hub Review: The Play That Wasn't There, or: Are We Pinter Yet? The Play That Wasn't There, or: Are We Pinter Yet? Rebecca Harris, Dennis Parlato, and Jay Ben Markson in Mrs. Whitney. Photos: Meghan Moore. With John Kolvenbach it always seems to be "one step forward, two steps back." This prolific playwright keeps getting produced, and so I keep getting exposed to him. And I keep being mystified by the fact that he keeps getting produced, and that I keep getting exposed to him. Or at least I felt that way until I saw Love Song, which Orfeo Group did last summer, and which had at least one great idea, and some sharp writing, to recommend it. Love Song also sang with something like a theme - call it "romantic autism," or "relationship autism," if you will - that I suddenly realized had been a component of everything I'd been seeing by Kolvenbach all along. This playwright seems obsessed with relationships that are in the end impossible because of the perceptual or emotional deficits of his characters; what made Love Song so witty was that it turned this gap on its head; the play's romantics learned to conduct the most passionate of affairs with themselves, and their own fantasies - indeed, it turned out the script's central love object wasn't even there. So I actually began to think - you know, maybe there is something to this guy after all. 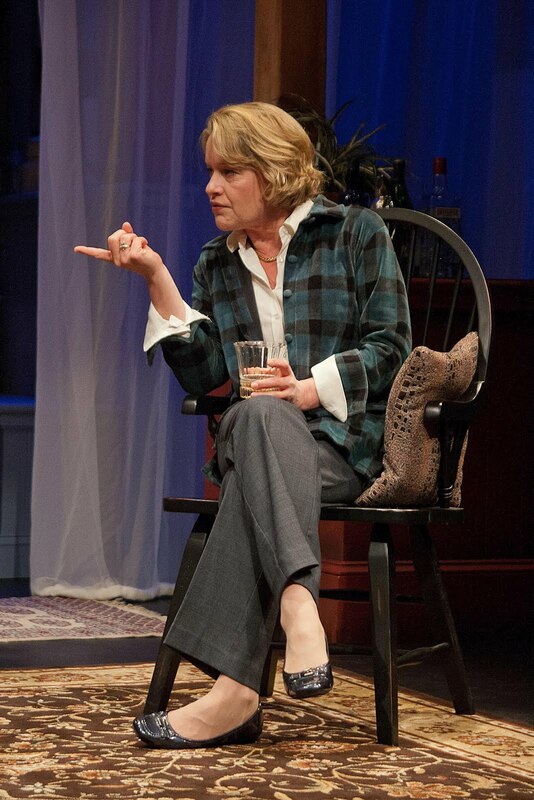 But now I've sat through Mrs. Whitney (which closes this weekend up at Merrimack Rep), and I think I'm ready to throw in the towel again on Mr. Kolvenbach, even though in some ways Mrs. W. counts technically as a step forward for him. He does juggle more characters here than he has previously, and attempts to connect to a longer timeline, while conjuring an unstable sense of the past; he's trying to expand his range. And yet at the same time a kind of playwriting autism seems to be afflicting him; for his superficial new accomplishments in Mrs. Whitney are all undermined by deep dramatic lacunae - that's a fancy word, btw, for voids. As in empty spaces. Vacuums. We leave this play, in fact, never quite comprehending what it has been about, or whether it was even intended to be about anything at all. Which, yes it has occurred to me, may be the larger point. Is Mrs. Whitney actually a huge conceptual-art gambit, one whose clever surface conceals the fact that it is actually another "show about nothing"? I often pondered this during the course of the performance at Merrimack (which seemed obsessed with actory surface, btw), and I got the feeling it had also occurred to Campbell Baird, the production designer, as he'd built a cheery winter homestead out of plastic and drapes, with fake snow on the windowpanes and holes in the walls opening onto - well - black, empty voids. This house isn't really here, the set all but screamed, because these people aren't really here, just like their relationships aren't really here - because this play isn't really here. So if that was your intent, Mr. Kolvenbach - to write a play that wasn't really there - then congratulations! You have succeeded! You have expertly shrink-wrapped a good deal of clever dialogue around absolutely nothing at all (except possibly denial). Oh, I know there are things that seem to be here, like - well, alcoholism; and infidelity; and lost love and loneliness and despair. But none of those things are actually there, are they. No, I'm quite sure they're not. The only question for me is - do you think they're there? Ah, perhaps there's the rub. For I'm afraid there's at least one other explanation for Mrs. Whitney. The first is that John Kolvenbach has brought off a brilliant aesthetic illusion. The second, however, is that he just doesn't realize he has left out everything that counts about a play. And I admit that when I learned Mrs. Whitney was actually the second part of dramatic diptych (the first play of the duo is called Goldfish), I did begin to lose faith in that first explanation! For in interviews Kolvenbach has actually opined that Mrs. Whitney was written to further explore the background characters of Goldfish. And in the Merrimack program, he muses that his script "is a comedy. About heartbreak." Okay, but he goes on: his plays are "scored," he explains; the empty spots in the script "serve the same purpose as the lines in the play . . . they convey information . . . the audience will only receive the play if the music is in place. The plays should sing." Oh, no. Oh, shut up John Kolvenbach. Please shut up. Because all that makes the conceptual gambit explanation a little hard to swallow. I mean . . . you don't really think you're some sitcom Pinter, do you? That your gaps and lacunae operate with some sort of resonant mystery? Oh, no. But - oh well!! I'll go through the set-up of the drama anyway, and let people decide for themselves. We meet the eponymous Mrs. Whitney (Dierdre Madigan, at left) just after Christmas, when she's brooding on her empty nest (her daughter is now grown, and AWOL). We sense that we're entering the scene after some sort of crisis (Gap #1), but we've no idea what it might be (my advice is: check the script of Goldfish). At any rate, there's a neighbor on hand, Francis (Joel Colodner) who is eager to make her less lonely, but she sets her eye instead on the former Mr. Whitney, whom she divorced for very good reasons something like two decades ago. We have reason to doubt Mrs. Whitney's judgment on this score, of course - just as we have some reason to doubt her judgment on everything. We get the impression, in fact, that we may have caught her in the middle of drinking herself to death (she actually orders Francis to take the food he has brought her out of the house and leave it in the snow). But then again - maybe not; she certainly seems to be entirely in hand, indeed, she's a model of crisp, ironic control. Hence - Gap #2: What's up with Mrs. Whitney? But onward. Mrs. W. pursues the former Mr. W. to the aforementioned cheery homestead, where the current Mrs. Whitney (Rebecca Harris) is waiting to brain her absent husband - or whoever walks through the front door - with a shot glass. It seems that Mr. Whitney has gone missing, as he often does - indeed, it seems one key reason why all the various Mrs. Whitneys (there have been four or five, I can't quite remember exactly how many) have left this serial divorcer is that he's simply often missing. (Hmmmmm.) Why he goes missing is unclear - although he seems to be on the wagon now, so maybe his absences have been alcoholic benders; or maybe they were meant to prevent him from going on alcoholic benders (that was Gap #3, btw, and probably Gap #4; are we Pinter yet?). Now taken together, these various vacuoles do suggest some sort of thematic profile that (normally) a playwright might be interested in exploring. But not Kolvenbach. He keeps his 'action' - essentially a zillion variations on denial - humming, that's for sure - Mr. Whitney shows up, the current Mrs. Whitney walks out, the previous Mrs. Whitney moves in, etc., while Fin, a forlorn son of Whitney by some previous Whitney, tramps in and out, cracking mighty wise. There's a short diversion with Francis, which of course comes to nothing. There's a hint that Mrs. Whitney actually has completed her emotional mission, perhaps unawares, by connecting briefly with Fin - but if you blink, you miss this. By now you can almost hear the clock ticking . . . will the playwright make it past 90 minutes without actually revealing anything? Hurrah! He does, and the script can end - with a restatement of its opening line; the whole pointless exercise has been circular - get it? Yes, we get it. But to answer my rhetorical question - no, we're still not Pinter. You see, in Pinter (and Beckett, and any number of other absurdists) the mysterious gaps around which the action revolves seem to expand as we watch; the lacunae grow in significance, because the playwright is steadily delineating their form and pressure; statements about faith, and power, and knowability are ultimately made - just indirectly. But no such luck in Kolvenbach. He seems to think that simple denial is theatrical subject enough. Still, you do get to enjoy some finely wrought superficiality at Merrimack; this theatre pulls in the best actors from all over, and they've wasted some fine ones on Mrs. Whitney. I'll say this much; Kolvenbach can write banter; everybody in the play speaks with the same self-aware, sitcommy voice, but these actors make at least their jokes sing. As the heroine, Deirdre Madigan was all tart/bitter wisdom masking - well, something, but who knows what; despair? Self-hatred? Your guess is as good as mine, but at least she's dry as a good martini. There was an arguably even sharper turn from Rebecca Harris as the fourth or fifth Mrs. W. - we last saw Ms. Harris being equally good in Kolvenbach's godawful Fabuloso; please, please can we see this fine actress in something other than John Kolvenbach? Rounding out the cast, Jay Ben Markson gave a precise spin to Fin's one-liners, Joel Colodner did what he could with Francis, and Dennis Parlato remained likably, knowingly poised while revealing absolutely nothing of himself (of course) as Whitney. 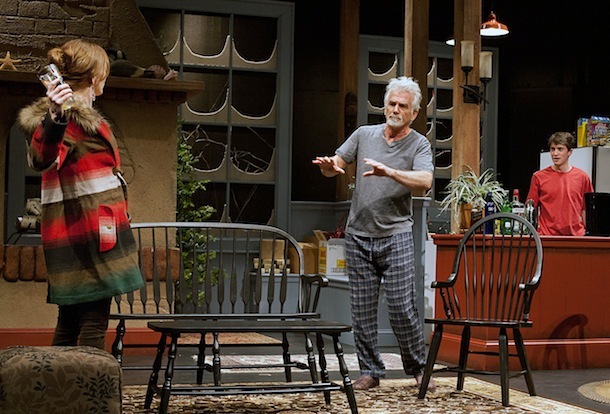 I'm not sure what to make of Kyle Fabel's emotionally under-realized direction; I guess that's what the play called for, but still - that's kind of the problem, isn't it. Sigh. And I notice that yes, the Merrimack has programmed another John Kolvenbach for next season. Which I think is evidence of a certain lacuna in the decision-making of this normally reliable theatre! But who knows - perhaps the next Kolvenbach will be another Love Song. At any rate, the mystery continues . . .
Deirdre Madigan and Jay Ben Markson actually connect, briefly, in Mrs. Whitney.